Great Shades of Satan! (Ah ha!) This falls under the category of educational toys. At least I think it does. This is for either potty training or training to waste time on the potty. Maybe both. Remember yesterday’s imponderable about the guy who broke into a home and twice defecated on the floor? I wonder if he used this. I have to admit that when I first saw this, I misread the author’s name as “Simon Crap.” It is an easy mistake to make. 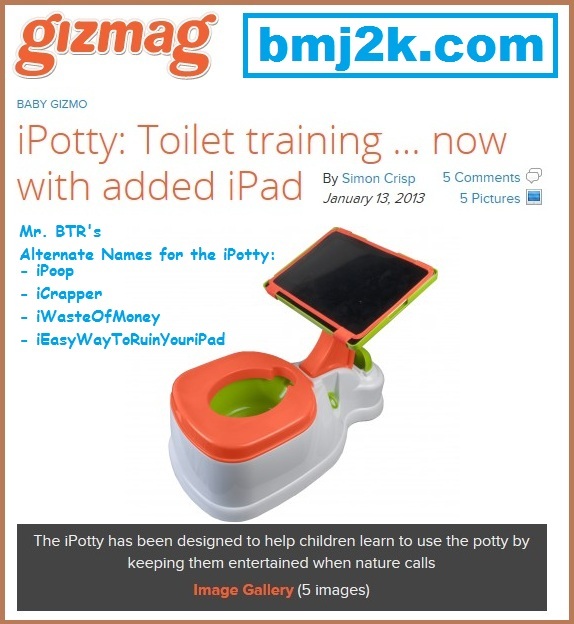 Before you ask (not that I can hear you), the iPad is not included and no, there are no apps to help the kid learn to use the potty. I guess the secret is that the kid will sit there and forget his anxiety about popping by playing Angry Birds or watching funny kitten videos on YouTube. Personally, I wouldn’t mind if the kids surfed over to Mr. Blog’s Tepid Ride. Sure, it would be a different demographic but I could really use the clicks. If it took off, I could totally see myself pandering to the pre-K group- lots of articles about Nick Toons, even more poopy jokes, etc. As far as I can see, all do is A-teach kids to spend more time on the toilet and B- create an iPad that I would not touch without rubber gloves and disinfectant. Little kids are not exactly neat and do not wash their hands. Plus they play with the most disgusting things. Truth to tell, this isn’t any different than putting the kid on the throne and giving him a book or a magazine to pass the time. That always works for me. Want more parenting advice? Check out this important warning. If this is real, then I have a concept for a Roomba cleaning robot that recites passages from Dickens, Ogden Nash or E. A. Poe as it scurries from room to room on its pre – programmed route.